Babus is one of the biggest Mercedes tuners not named AMG and today's Nice Price or Crack Pipe E320 wagon is supposed to carry that modder's looks and handling upgrades. Will its price however, upgrade your interest? While a claimed pre-production escapee from the crusher, and sporting a JALOPNK license plate of incalculable value, yesterday's 2010 Mustang GT still proved not worthy of its Buy-It-Now, at least to 80% of you who voted it down in a Crack pipe loss. Even with its Grabber Blue paint job, its price wasn't really grabbing anybody. You know what color is most often associated with the automobiles of Germany? That's right, Hi-Ho Silver! Today's 1998 E320 is German as a shepherd, but instead of unfinished beer can, it's a stealthy shade of black. It's also a longroof and according to its ad, has springy bits and a body kit from the venerable house of Brabus. Now, Brabus has been around for a very long time, having been founded in Bottrop Germany all the way back in 1977. The company is famous both for undertaking any level of modification to a customer's existing car that money can buy, and for doing crazy things like dropping humongous V12s in E-Classes. Today's W210 sadly doesn't have one of those bad larrys. In fact, it rocks just half that cylinder count. What it does have is a 221-horse M112 V6, which displaces 3,199-ccs and represented the entry-level mill for E entertainment back in 1998. Here that's backed up by the standard 722.6 5-speed automatic, and the whole works have done a modest for their age 138,000 miles. I don't know about you, but I find the estate edition to be the W210's most attractive body style, and like most mid-size or larger European wagons of the era it sports folding rear-facing seats in the back-back for all your hind sighting pleasure. This one additionally sports the aforementioned Brabus bodywork which seems to be focused heavily on that backend. There you'll find a subtle spoiler on the hatch, extended bumper apron and smoke-em if you've got 'em tail lamp lenses. The ad says that the car also sports Brabus suspension but does not go into detail as to what upgrades have been made down south. On the downside, it does seem to be wearing a loincloth in the ad to protect its license plate identity. That's not a good look. 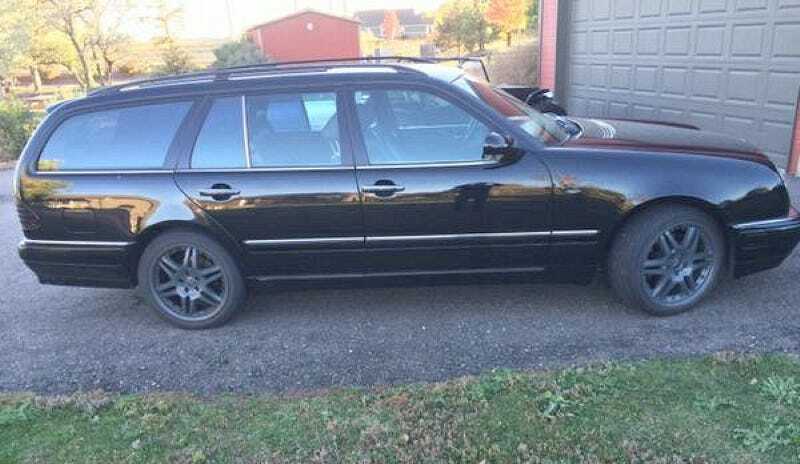 Other than the Brabus connection, this looks to be a solid edition of the W210 estate. These cars lacked the bank vault build quality of earlier Benzes but they do still come with a ton of features and niceties like a wood and leather tiller and power most things. The ad notes that the car comes with both its summer five-star wheels as well as an extra set of wheels and meats for winter fun. All that can be yours for $6,500. There's a lot to like here, and while I would take question with the ad's claim of the car being VERY FAST, it's still seemingly very nice. What do you think about that price for this Babus-blessed Benz? Is that an amount that seems like a deal for this longroof Mercedes? Or, is that too much of a fare for this Brabus? Boulder CO Craigslist, or go here if the ad disappears. H/T to bouldergeek for the hookup!